Love your card Tammy! All those dogs are adorable! You will be missed, but I am sure you are enjoying your freedom of deadlines! Wishing you all the best!! Your amazing talent and wonderful sense of humor brought me joy on so many occasions, Tammy!! Know that you are loved and wished the very best in each and everything you do! 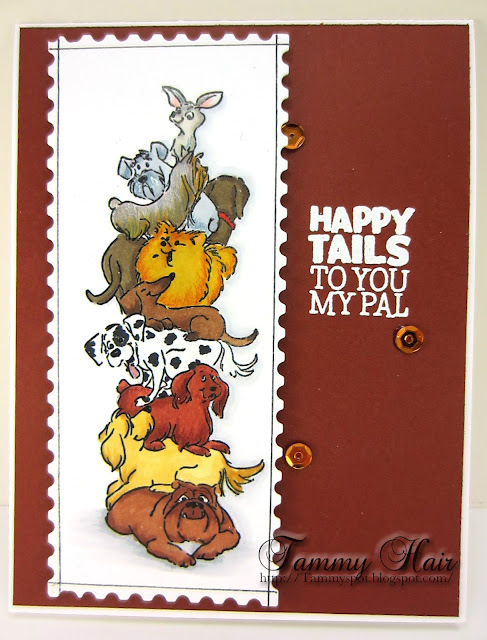 I am delighted that your final card for us is this fabulous pile of pups!! How perfect is that? Go with God, my sweet cyber friend!! I'm glad I scrolled through Bloglovin' this morning. I switched to Feedly, so don't always check it, but this morning... Tammy, it's most important that you've enjoyed your time not blogging. It sure opens up a world of time, doesn't it? I'm always amazed at how much else I get done on any day I don't turn on the computer. I'm not yet ready to give it up, but I can certainly understand. Go have yourself a beautiful life full of varied activities and joy, and know that a little bit of Tammy will always be here with me. Hugs!